Appendix surgery or appendectomy is a surgical procedure which includes removal of the appendix. The appendix is a worm like blind-ended tube attached to the cecum, the proximal part of the large intestine. This organ is not functional in humans even though there were certain studies which tried to confirm the importance of the appendix in harboring and protecting of the bacteria beneficial for the proper function of human colon. Appendicitis is an inflammation of the appendix and this medical condition requires surgery. The surgery should be performed prior the rupture of the appendix since this can lead to many serious complications including death. 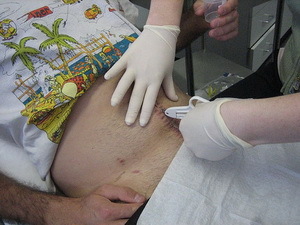 Today appendix surgery is routinely performed laparoscopically. Only in case of its rupture the patient undergoes open abdominal surgery. The recovery time after appendix surgery depends on whether the patient has undergone laparoscopic removal of the appendix or open abdominal surgery. The recovery time lasts longer in case of open abdominal surgery especially if the appendix ruptured even prior the surgical procedure. In case of rupture the surgeon cuts the patient, removes the appendix, cleans the peritoneum from the collection of puss and places the catheter into the abdominal cavity which will assist in removal of the remaining puss and fluids. The patients are given high doses of antibiotics to prevent potential sepsis and lethal outcome. After rupture of the appendix, the patients are held in hospital for longer period of time. Even though appendix surgery is routinely performed in some cases there is an increased risk of postoperative complications. This particularly refers to cases in which the appendix ruptured prior the very operation. The most common complication after appendix surgery is infection. Since the removal of the appendix is performed because this organ is inflamed it is clear that even after its resection there are residual bacteria in the abdominal cavity which may lead to further spread of the infection. This potential complication is prevented by high doses of antibiotics given to the patients after the surgery. Infection of the wound is usually caused by inappropriate handling with the bandage. One more possible complication is bowel obstruction. Bowel obstruction develops as consequence of adhesions. They form after the surgery and bowel may get trapped by them which eventually causes blockage. In severe cases bowel blockage requires surgery. In extremely rare cases there is a chance of forming a fistula on the front abdominal wall. Namely, after resection of the appendix the cecum is stitched. However, if these stitches break down the hole may reopen. To prevent the leakage of the colon contents the body attaches the hole to the front wall of the abdomen and this connection eventually results in a fistula. Luckily, this a very rare complication of appendix surgery. Groin pain after appendectomy. Could the infection have damaged some tendons or even my hip joint? Can my appendix rupture be healed with a hospital stay and antibiotics?